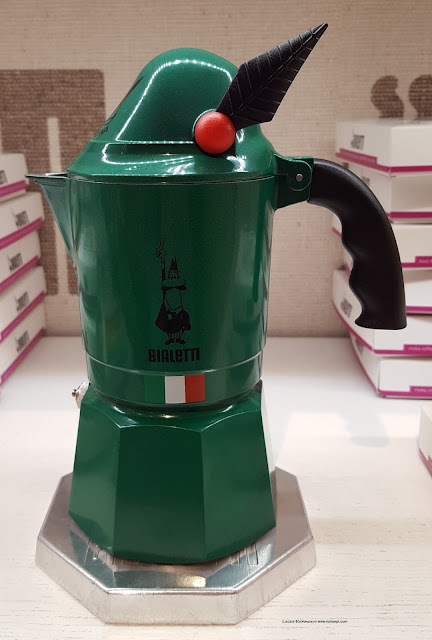 Alpini are an elite mountain warfare military corps of the Italian Army and currently the oldest mountain infantry in the world! They were established in 1872 to defend the mountain borders with France and Austria but in 1888 they got deployed to Africa too. They fought hard during WWI and WWII and many died on the Eastern front in the Balkans. Since 1990 they have been deployed in Afghanistan. The first idea was that the men originally from the border areas would have a better knowledge of the territory and a much deeper motivation to protect it than regular military corps from the rest of the country. So in 1872 the first group of only 15 Alpini companies were created. Recruiting directly in the mountain valleys, at the border with the enemy, was the winning innovation because having grown up on the mountains they knew those areas extremely well and could easily adapt to the weather too. The Alpini hat is not just a mere accessory but their symbol together with the black raven feather that has also become their nickname as in Italian they are known as le penne nere or The Black Feathers. At the beginning, the hat was a round black felt hat, but when the green-grey uniform was adopted in 1910 the hat was changed to the distinctive grey felt hat we still see today. 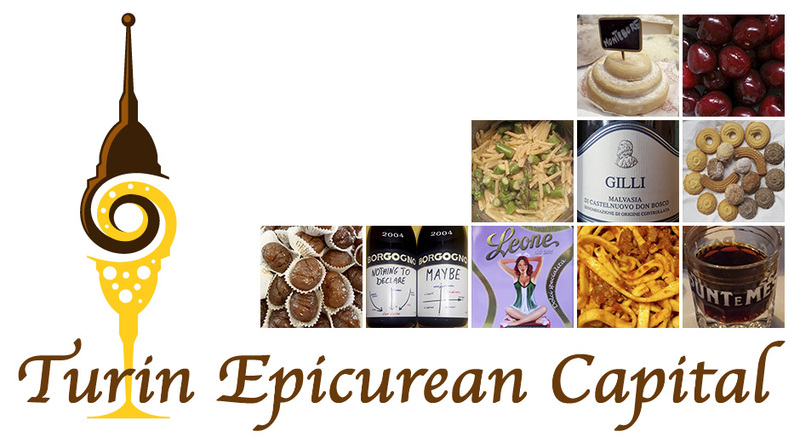 The Cappello Alpino is made of grey felt a quarter of an inch thick. In the front the rim is flattened to protect the face from rain and snow. On the left and right side there are four small metal encrusted holes to allow skin ventilation. Around the lower half of the round top section a green-grey leather band and for officers a golden braid encompasses it. 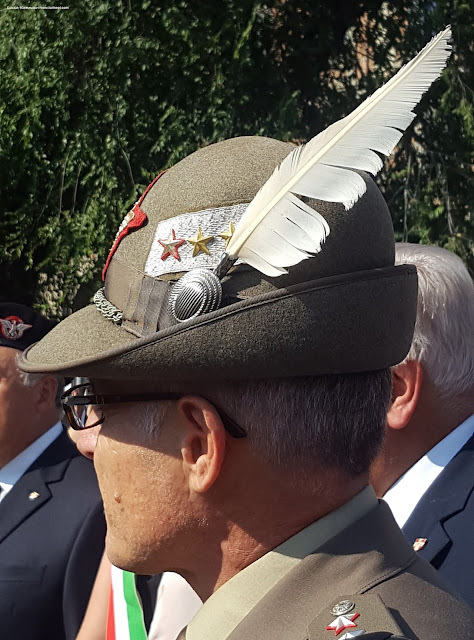 Each soldier is issued with a black raven feather, which he will carry at all times on his Cappello Alpino. When in combat the feather will be placed on the left side of the helmet. Officers above the rank of captain originally wore a white eagle feather, which has been replaced in later years by a white goose feather. Non-commissioned officers and officers up to the rank of captain continue to carry a black eagle feather. The feather is approximately 10-12 inches long and is carried with a slight backward and inbound inclination on the left side of the Cappello. The fregio or a coat of arms sewn on the front indicates the regiment. It is black for soldiers and golden for officers. Today, soldiers serving on a permanent basis are issued the golden variant of the fregio too. Each fregio carries an eagle with spread wings on top and below symbols, which indicate the wearer's regiments specialization (i.e. artillery regiment, logistics regiment,...) and at the center of the fregio a half-inch circle with the regiment's number. As for the nappina or tuft is a small piece of wood sewn with colored wool thhreads. The piece of wood has a little hole to hold the feather. Also a thin bended wire juts out from the wood to allow the nappina to be latched onto the left side of the hat. The nappina was first included to mark the battalions, in fact, each one has its own color. Besides the symbolic hat with the black raven feather, Alpini also sport the green flames collar patches. 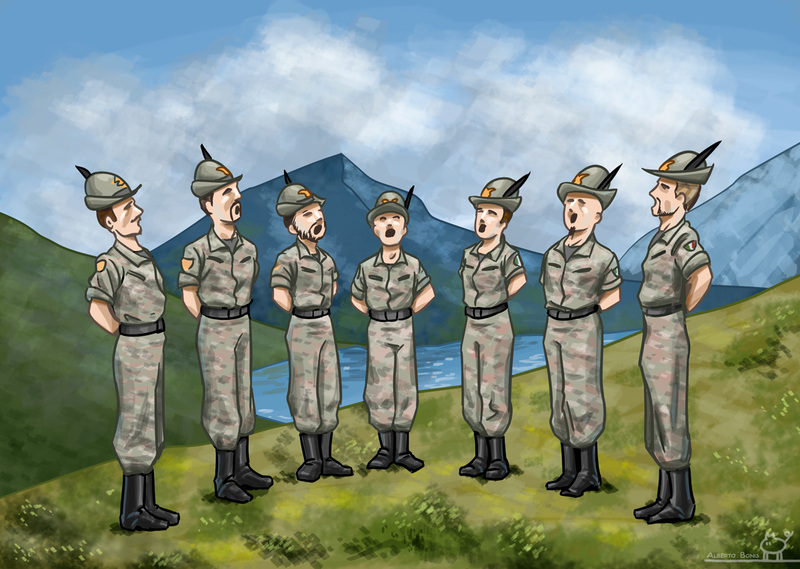 Especially in the mountain valleys, the Alpini pride lives on even to these days of peace because the local recruitment increased the bonds and self-identification between the locals and the Alpini units. As the men assigned to a specific company were all recruited from the same village, and the companies from one valley were all part of the same battalion, Alpini have always been an integral part of their social structure. Their values and acts reflected their origins and their villagers identified in their heroic lives. In 1887, a special Battalion composed of volunteers from other battalions was formed and sent to Africa. Over the years and the wars this battalion was reformed and deployed abroad again. In 1900, because of the Boxer Rebellion, a Mountain Artillery Battery was sent to China as part of the international relief force that lifted the siege of the International Compound in Beijing, and remained on garrison duty in Tianjin until the end of 1901. In 1902, Alpini began to form specially-equipped and trained Skiing Companies (Italian: Compagnie Sciatori). Because of their endurance, Alpini were also sent to help Italian communities recover from major earthquakes in Southern Italy. WWI made Alpini famous because their won major battles on glaciers, up in the Alps, in terrible conditions and against strong enemy military corps. 12 meters (40 feet) of snow were common and during the winter of 1915/16 thousands of soldiers died in avalanches. The remains of these soldiers are still being uncovered today. 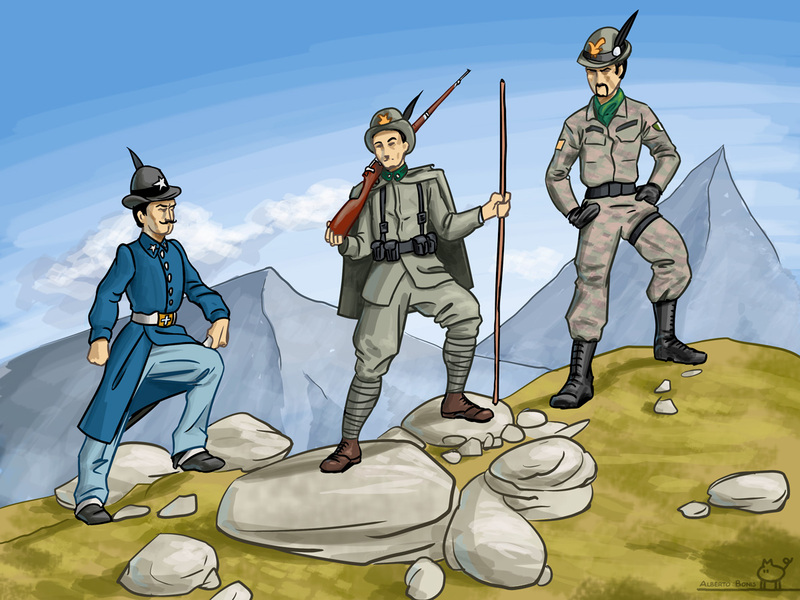 The Alpini, as well as their Austrian counterparts occupied every hill and mountain top around the whole year. Huge underground bases were drilled and blown into the mountainsides and even deep into the ice of glaciers such. Guns were dragged by hundreds of troops on mountains up to 3,890 m (12,760 feet) high. Roads, cable cars, mountain railroads and walkways were built up, through and along the steepest of cliffs. Many of these paths and roads are still visible today together with what remains of hundreds of kilometers of barbed wire. Back then, whoever occupied the higher ground first was almost impossible to dislodge, so both sides turned to drilling tunnels under mountain peaks, filling them up with explosives and then detonating the whole mountain to pieces, including its defenders. Climbing and skiing became essential skills for these troops and soon Ski Battalions and special climbing units were formed. It was during these years that the Alpini, their spirit and their mules became famous, although at the cost of over 12,000 casualties out of a total of 40,000 mobilized Alpinis. WWII and the Alpini experience marks one of the most meaningful pages of the Italian history. 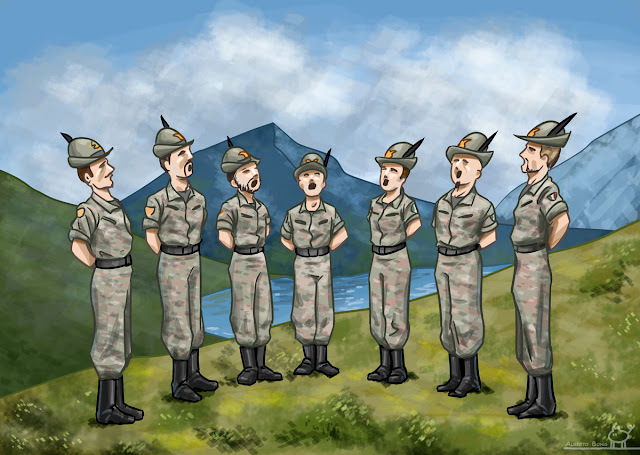 Alpini divisions were sent to France, Africa, Italy, Albania, The Soviet Union, Yugoslavia and Greece and even East Africa. In 1942, three divisions were sent to fight in the Soviet Union. However, once in Russia, instead of being deployed in the Caucasus mountains as expected, the Alpini were tasked with holding a front on the plains of the Don River. Naturally this was a disastrous strategy and the troops armed, trained, and equipped for mountain warfare were pitted in the plains against tanks and mechanized infantry, to counter which they were neither equipped nor trained. Despite this, the Alpini held the front until January 1943, when, due to the collapse of the Axis front, they were encircled by the advancing Soviet Army. The Alpini were able to break the encirclement and fight their way towards the new line of the front established after the Axis retreat. Only about one third of the Tridentina division (4250 survivors of 15,000 troops deployed) and one tenth of the Julia (1,200/15,000) were able to survive this odyssey. The Cuneense division was annihilated. When Italy got split in half in 1943, the king went to the South of Italy and left the Royal Italian Army without any orders; most divisions of the Army surrendered without a fight to the invading German forces. The only Alpini division to resist the Germans was the 1st Alpine Division Taurinense (from Turin), which along with the 19th Infantry Division Venezia and remnants of the 155th Infantry Division Emilia resisted German attempts to occupy Montenegro. After suffering heavy casualties the divisions troops were given the choice to either surrender or to retreat into the Durmitor mountains and continue the fight. 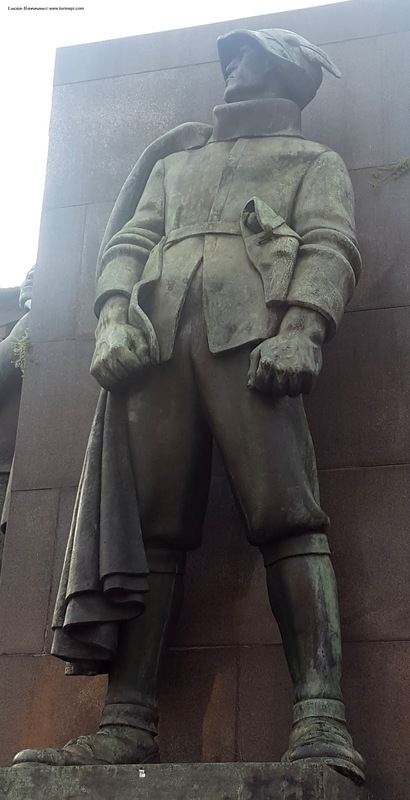 The 16,000 men, who had chosen to fight, formed then the Italian Partisan Division Garibaldi, which entered the II Corps of the Yugoslav Partisans and fought on the Yugoslav Front until it returned to Italy in March 1945. In 1944, the 3rd Alpini Regiment was recreated in Southern Italy; along with the 4th Bersaglieri Regiment it formed the 1st Italian Brigade of the Italian Liberation Corps, which fought in the war on the Allied side. After the Bersaglieri regiment had suffered heavy casualties, the two regiments were merged on 30 September 1944 to form the Special Infantry Regiment, which entered the Legnano Combat Group - equipped with British weapons and materiel and fought as part of the Polish II Corps on the extreme left of the British 8th Army near the river Idice. In the north, a fascist regime led by Benito Mussolini (Republic of Salò) continued the war alongside the Germans. Its Army, the fascist National Republican Army, raised the 4th Alpini Division "Monte Rosa", trained and equipped by Nazi Germany. The division fought along the Gothic Line, notably against units of Brazilian Expeditionary Division, U.S. 92nd Infantry Division and 8th Indian Infantry Division. At the end of the final allied offensive, the division surrendered after the Battle of Collecchio. 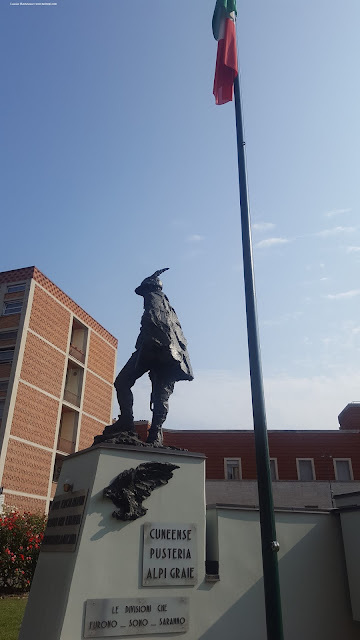 Today, only two Bridages remains: Taurinense and Julia yet their black raven feather hasn't faded at all and whenever they appear in a public gathering Italians still feel a strong sense of reverence toward what they represent: their bond to the land, their values and dutiful endurance.